Green Watch firefighters from Hove have successfully powered home to regain the new World Record Pole Drop title. They smashed the old record of 6,188 and reclaimed the world record for the furthest distance sliding down a firefighter’s pole, reaching an impressive combined drop of 8019.2 metres. Verification of their world record attempt is still underway, which involved them scaling a total height, greater than Mount Kilimanjaro. 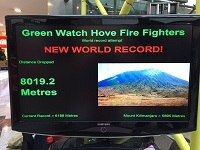 They achieved their aim of smashing and grabbing the world record, which they set back in 2009, as well as chatting to members of the public about fire and road safety. They trained hard for the event, which took place on Saturday 19th March, in Brighton Churchill Square, which attracted a large crowd of onlookers who cheered them on. You can see the hard work and training put into this challenge by viewing their YouTube footage. Hundreds of people watched on as the team of 10 set out to climb the 4-metre ladder and drop down the 5.6-metre pole. This is no easy feat as each team member had to manage 140-plus slides of the pole each. The team raised £400-plus, which will be donated to the Rocking Horse Charity and the Fire Fighters Charity, but donations are still coming in and so this figure is hoped to be even greater. Green Watch are still waiting on the two charities to count up what they received in the buckets on the day.